Back in pre-GFC 2008, world leading Rowing Boat Manufacturer, Sykes Racing was spread across several small factory buildings on the side of a hill in Geelong. Sykes boats had migrated from wood to sophisticated carbon fibre composites many years before, but the manufacturing mindset was largely unchanged. A traditional “craft” approach was used where one person built the boat from start to finish. Almost every boat needed some form of rework at final inspection where the most skilled craftsmen looked over the boat from top to bottom. The result of this approach was highly variable output and little control of backlog. At the time of starting the project Sykes had a backlog of 6 months and was coming under pressure from imported Chinese boats. Sykes Managing Director, Jeff Lawrence asked the Enterprise Connect business advisor from the Geelong Manufacturing Council to do a free of charge business review. This revealed the need to introduce Lean manufacturing concepts. TXM coached the Sykes team to develop a value stream map. However the rubber really hit the road when Sykes applied the TXM plant layout process to the long thin rowing boats. The result was an “S” shaped flow layout that enabled the business to potentially double output, but locked it in to moving from “one man builds the boat” to “one piece flow” and standard work. 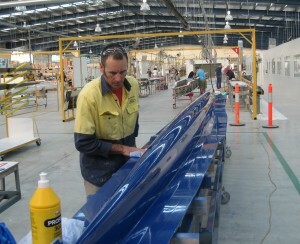 The layout involved moving the boat through a sequence the manufacturing process steps at a rate of one boat per day. A small FIFO lane was set up between the laminating and fit out process, but apart from that the boats needed to move everyday to keep the process flowing. Sykes Racing did standard work analysis of every process step in order to level the amount of work at each workstation. This was complicated by the fact that every boat is different and the standard work had to allow for this. Subsequently Sykes used what the TXM team now call “Fuzzy Standard” work, where work elements are measured in minutes and some variation in cycle times from job to job must be allowed for. Also adding complexity were the riggers used to mount the oars on the boat. These were made in parallel to boat manufacture through an entirely different process. Delays to riggers were a frequent cause of hold ups in finishing boats. Sykes developed an improved flow in their metal shop to ensure that riggers were delivered early and were on hand when the boat reached the end of the line. Apart from ensuring the flow, the standard work process lead to significant productivity benefits as differences in the time taken to complete tasks were highlighted and all operators trained to follow the best method. After some initial teething issues, this standardisation of method has lead to further improvement of Sykes’ already high quality standards. Once the standard work was underway, the final stage was to shift the focus back to reinforcing the Lean foundations. 5S, structured problem solving and Lean daily management where team leaders coach their teams through short daily “stand up” meetings. This has ensured that Sykes have stabilised their process and continued to improve. The results have been spectacular. 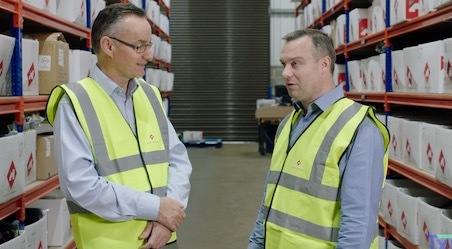 Apart from having a spotless factory that now leads the world in productivity and quality, Sykes have reduced their order back log from 6 months to 6 weeks along with increased output, increased productivity and reduced rework.